CHIKOMBA DISTRICT, Zimbabwe — It is the middle of the rainy season and many roads have been washed away, making the drive to the village longer than usual. The four-wheel drive dips dangerously into crested streams, the water rising above the wheels. At times it loses traction in the mud, slipping and sliding, this way and that way. On either side of the road there are large boulders, many of them piled on top of each other. Zimbabwe is home to boulders that would give Stonehenge a run for its money. Women celebrate the arrival of Heifer staff to their village in Chikomba, Zimbabwe. When we arrive at the Shona community, men are seated under a large tree, shading themselves from the midday sun. Women dance and sing loudly in a merry group. There is clapping, ululation and hugging; a palpable joyfulness fills the air. In this community, families are organized into homesteads. A small cluster of homes shows the intertwining of the past and the future. Concrete, tin-roof houses are interspersed with round mud homes topped with thatch. Small boys are seated under the shade of trees in the distance, herding cattle. Dogs walk about absentmindedly, and two large turkeys fight in the yard. Several dozen cows lounge in a pen a few hundred feet away, the ground muddied from the last few days of heavy rainfall. Esther Sibanda, a small, wise lady in a brown African dress and bright paisley scarf, is standing beside her son, Facewell Siyakalangelana. She points proudly to the 25 cows she owns. In 2007, Sibanda received 11 cows from a Heifer dairy project that started that same year. She remembers the exact date the animals came. “It was July 4, 2007,” she said. Since then, she has passed on 11 cows to other neighbors in need, sold some and added to her herd. “Dan West has done good things for us,” Sibanda said, referring to Heifer’s founder as if he was a personal friend. She talks freely of the benefits the cows have brought to her life: milk, manure and money. When her husband passed away in 1975, she was afraid for her future. In keeping with tradition, his estate went to his birth family; they took all his assets. “I was left with two cows,” she said, holding up two fingers to her face. “Then one died,” she added, and for a moment there was a deep sadness behind her eyes. Esther Sibanda received 11 cows from Heifer in 2007. The animals have multiplied quickly, and she has since passed on the cows to another family. But the cows she received from Heifer, in addition to the one she already had, made a big difference to her and the 15 members of her family—some of them orphaned grandchildren—whom she supports. “God gave me large spoons so I can stretch them and feed others,” she said, speaking in her native Shona, which is lyrical and peppered with the clicks that some southern African languages are known for. Sibanda’s story is not unlike many of her neighbors’; Simon Ramaboea, who also received cows through the same project, shares her sentiments, if not her dreams. Pointing to his cows, he tells his dream of one day becoming a breeder. Holding a cane and speaking in a booming voice, he said he plans to sell offspring from his herd to a breeder and expand this species of cow within the area. The indigenous Nguni cattle are highly valued but difficult to acquire. While they sell for $600 to $800 in his area, buying them from neighboring South Africa can cost as much as $3,000. For Zimbabwe’s smallholder farmers, increasing their ability to grow their own foods and expand their own markets means they become less dependent on imported food and increasingly food secure, Heifer’s ultimate goal for the country. And, fortunately for Zimbabwe’s rural farmers, large land parcels allow them to grow their herds. When the country became independent in 1980, the government redistributed land that had been previously held by Zimbabwe’s minority white population. Heifer provided larger than usual numbers of animals to farmers, which allowed them to increase the livestock populations more quickly while preserving the highly valued indigenous breeds of animals. However, in recent years the country became increasingly poor. With poverty came food insecurity. During the Passing On the Gift ceremony, members of the 'Deepening Impact' project pick numbers out of a hat. This allows for transparency and ensures the selection of animals is unbiased. Food security means people have access to safe and nutritious food throughout the year. A complex concept, it has to do not just with access to food, but availability and utilization of resources. Unfortunately, the dimensions of food security are many, as the causes can be both environmental and political. Poor soil quality and poor livestock breeds are only a small part of the reason why Zimbabwe is unable to feed its growing population. When compounded with inappropriate agricultural and economic policies, the problem only becomes worse. Nearly 870 million people in the world, or 12 percent of the global population, are undernourished, according to the Food and Agriculture Organization of the United Nations. In Zimbabwe, that number jumps to 30.5 percent, or 4 million out of 13 million people. In 2009, following a period of gross hyper-inflation, the Zimbabwean dollar, which had been the country’s currency since 1980, lost all of its value, forcing the country to abandon it in favor of the U.S. dollar, which is now the operating legal tender. At its worst, the Zimbabwean dollar had a denomination of a 100 trillion dollar bill, which was equivalent to about $300. Operating on the U.S. dollar means the cost of living for the average Zimbabwean has become very high. Everyday items, especially food, are unaffordable for many, making it even more important that people grow their own food and increase local production in order to reduce dependence on imports. William Munemo, a farmer who received cows from Heifer in 2007, illustrates the point. He recalls a time when he worked in the city as a clerk for the government but was forced to leave that job and move to his village to care for his ailing parents. When land was redistributed in Zimbabwe, his family received 28 acres. The animals that Heifer provided helped them grow their herd from just the two that they owned. Munemo lost his father in 1990 and his mother in 2005 but has been able to support his growing family with the assets he inherited. “I have the best animals,” Munemo declared proudly. He pointed to his fields in the distance. “We didn’t put any fertilizer there, just manure,” he said of the rich heads of corn swaying in the wind. From his cows he collects more than five gallons of milk per day. When selling milk became a problem, the community members organized themselves to start a milk collection center. Munemo has now become a cattle breeder, selling bulls to other farmers. “I have a backlog of farmers waiting to buy,” he said. Last year alone he sold five bulls ranging in price from $600 to $800. “Our dreams … we are fulfilling them. They are coming true,” Munemo said. It is through the stories of people like William Munemo and Esther Sibanda that Heifer sees how its almost 30 years of work in Zimbabwe is making a positive change. 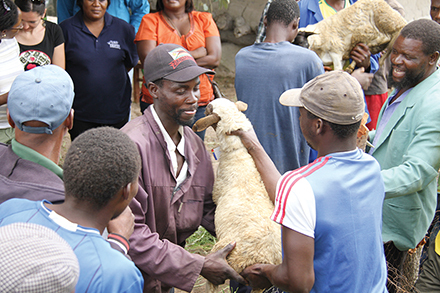 On Feb. 6, 2014, Heifer International re-launched its programs in Zimbabwe, making a renewed commitment to continuing work that has slowed over the past few years. The launch followed the relocation of Heifer’s offices from the remote village of Gweru to the capital city of Harare, which will allow staff to interact more with other development, government and private sector entities. The move also will open the organization to greater opportunities. Over the last few years, the changing environment in Zimbabwe created uncertainty about Heifer’s ability to continue work in the country, and the scale of programs has diminished significantly. Now, with a new lease on life, the program is planning to make new investments in the lives of dairy farmers. The dairy farmers in the Chikomba District, for example, are slated to receive additional support. Over the last five years, their growing herds began to produce increasing volumes of milk, creating a need to expand their markets beyond the local community. Of their own initiative they acquired an old, concrete building that they intend to turn into a milk collection center, creating a market for their milk. The group has asked Heifer International for training and other support. Their dream is to one day grow the center into a chilling plant to sell milk to an even larger market, eliminating the need to import milk from long distances or even neighboring South Africa, increasing income and food security in the community.